The new anime season of FULLMETAL ALCHEMIST started airing on TBS and NBS networks (to be webcasted on GyaO from April 10th) and it already seems engaging, gaining high reputations among fans. And more good news for the fans! From today some yonkoma comic-strips featuring the Elric brothers by author of the original manga series Hiromu Arakawa can be read on the official website. There's also free sample chapters of the light novel adaptation by Makoto Inoue, accompanied with illustrations by Arakawa. 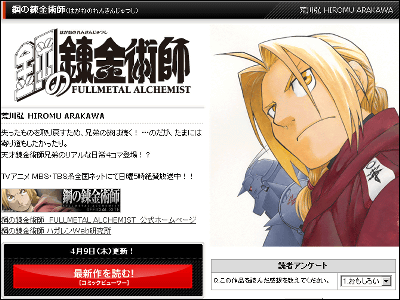 The original comic-strip by Hiromu Arakawa is described as some kind of side trip Edward and Alphonse Elric got carried away during their journey to find the Philosopher's Stone, with a comical twist. 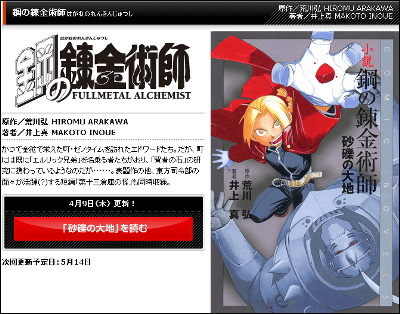 A full sample chapter of the light novel adaptation Fullmetal Alchemist: The Land of Sand is also offered, with more to come on May 14th. Click the red rectanglar button to read. Naturally, they're all written in Japanese but maybe you'll enjoy the illustrations. << NextNever tried Flowing So-men? Try it right now with “Somen-Ya” flowing somen kit!